Vitamin C and Niacinamide are the Britney and Xtina of skincare. Rumour has it, these two skincare superstars hate each other’s guts and can’t stand working together. But, when you peek behind the curtain, you’ll see them get on like a house on fire. What The Heck Is Vitamin C? The catch? Pure Vitamin C, a.k.a. L-Ascorbic Acid, is very finicky to formulate with. If the ph’s not right, it won’t work. If it comes in contact with light and air, it throws a tantrum and stops working. That’s why cosmetic chemists often ignore it. They prefer to use its derivatives, instead. They don’t work as fast, but are a lot less demanding. FIY, according to rumours, Niacinamide has “problems” only with L-Ascorbic Acid, not its derivatives. Related: Spotlight On Vitamin C: What Does It Do For Your Skin? What The Heck Is Niacinamide? See that last one? 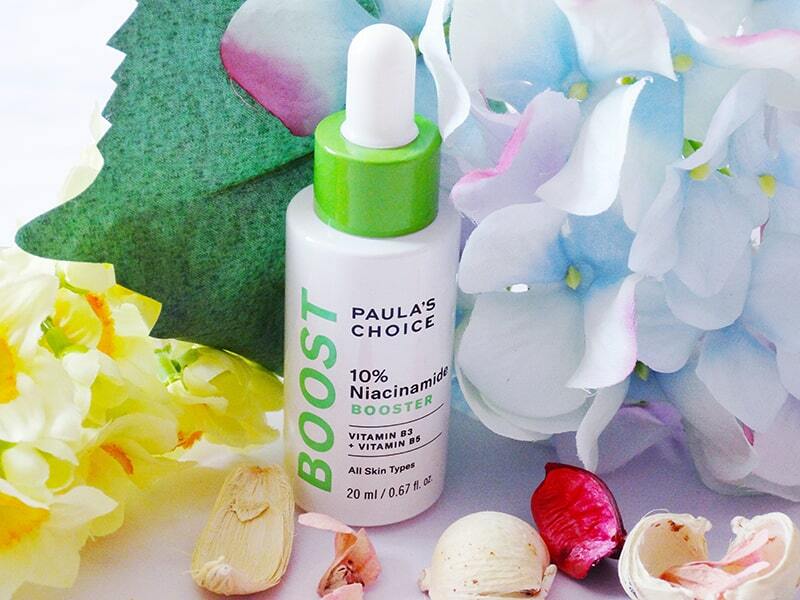 Both Vitamin C and Niacinamide can fade dark spots. It’s no wonder you want to use them together to speed up the process. So, why are you told you can’t? Related: Spotlight On Niacinamide: What Does It Do For Your Skin? Mixing Niacinamide with L-Ascorbic Acid (or any other acid, for that matter) turns it to Niacin, a substance that can cause temporary flushing and tingling. This is a problem only if you have inflammatory acne or erythema. When mixed together in aqueous solutions, Vitamin C and Niacinamide form of a complex that turns the solution yellow, making both ingredients ineffective. Should You Worry About Niacinamide Turning To Niacin? Vitamin C may be finicking, but Niacinamide isn’t. Niacinamide is an amide and those are tough. They don’t go bad when you expose them to light, air or heat, like other antioxidants do. That’s why you need a LOT of heat to trigger the reactions mentioned above. You can heat Niacinamide up to 120 °C (240 °F) WITHOUT Niacin forming. Of course, the more heat Niacinamide is exposed to, the faster the conversion occurs. But, at home, you NEVER expose Niacinamide to those temperatures. At home, you store your Niacinamide lotions and serums at room temperatures. That’s around 25 °C (77 °F). How long does it take for the conversion to occur at this temperature? If the solution has an acidic (low) ph, it’ll take 6 weeks to convert only 1% of Niacinamide to Niacin. If the solution uses thickeners (and most skincare products do), the conversion occurs even more slowly. For most people this isn’t a problem. The amount of Niacin formed under normal conditions is so tiny, you won’t even notice it. If your skin is super sensitive, then even this tiny amount will be enough to trigger flushing and tingling. This isn’t dangerous, but I still recommend you avoid this combo. Either way, you can always store your Niacinamide lotions and potions in a cool place. This’ll slow down the conversion even more. Should You Worry About The Niacinamide And L-Ascorbic Acid Complex? If you mix Niacinamide and L-Ascorbic Acid together, the solution turns yellow. That’s the colour of death for Vitamin C. It usually means it has oxidised and become useless. BUT, not in this case! In this case, the yellow colour is caused by the formation of Niacinamide Ascorbate. Basically, an electron transferred from Vitamin C to Niacinamide, holding them together. Ph matters here. Niacinamide Ascorbate forms at a ph of 3.8. Change the ph and way less of it appears. You know what this means? This reaction is reversible. This matters because the surface of your skin has a ph of around 5, but the deeper layers a ph of 7. So, as Niacinamide and Vitamin C move deeper into the skin, they tend to go their separate ways, forming less and less Niacinamide Ascorbate. The best part? Niacinamide Ascorbate isn’t as useless as it seems. Studies show it can still help fight sun damage. You can totally use Vitamin C and Niacinamide together. The chemical reactions they trigger are very slow or reversible so they can’t compromise their effectiveness. 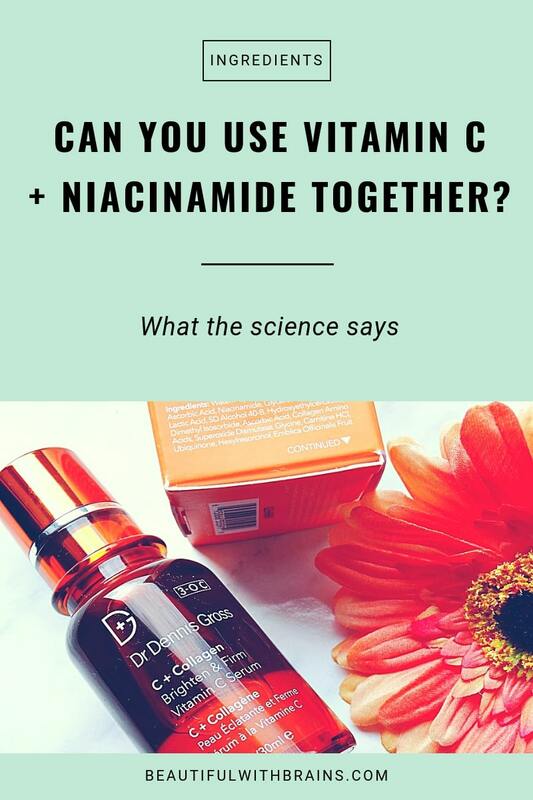 Do you use Vitamin C and Niacinamide together? Share your thoughts in the comments below. Reddit cosmetic chemist Stephen Alain Ko was the first to point out they can be used together. For more skincare science, go check out his blog. Thank you for this very well constructed article. I just recently bought The Ordinary’s Niacinamide and I want to use it in the same routine with my Vitamin C, but I had also heard the warnings about mixing the two. I may test out using them both in the same routine for a week to see the results. Liv, my pleasure. 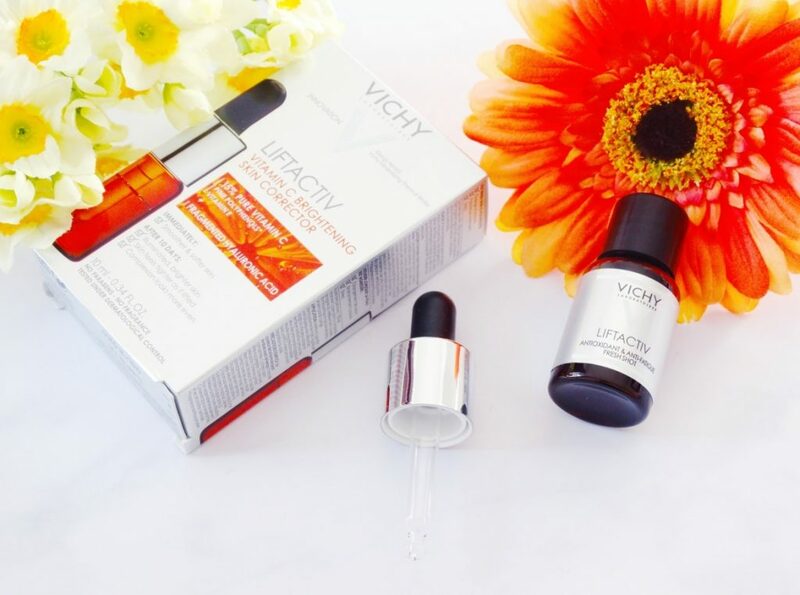 There is no reason why you shouldn’t use these two antiaging superstars together. Let me know how your experiment goes. Thanks for sharing, how about matrxily, can I use all three together? Angie, yes you can. Just wait until the vitamin C serum has dried before applying the next product. Hii! Very well informed!! Using both of these active ingredients together has been a debate for long time!! Even I have read in many articles that, to go these ingredients bad or counteract each other, there has to be a right high temperature, right low ph, percentage and right consistency of solution!! Since every individual has different skin identity, companies want to safe than get sued!! I have used once Tiam 20% C source serum and Cosrx PHA Moisture renewal cream (which contains 3% Niacinamide, 2% PHA and ph of 4-5) in a same routine and didn’t have any problem for my dry sensitive skin (I am so sensitive to quite a lot of ingredients). So, I am sure, that it’s not always wrong!! I wanted to use Tiam 20% C source Serum + The ordinary Matrixyl 10% + The ordinary 100% plant based squalane in a same routine, will it be ok? cause it is said that Pure Vitamin C and peptides promote collagen synthesis. I would like to know your opinion? I also review K-Beauty products at http://www.skbbi.com , also I would also like to know what you think of my content! I really think that you do have immense experience and scientific knowledge in this field!! Yes, you can use them all in the same routine. Vitamin C is one of the best things you can use on your skin and, in high enough doses, it can boost collagen. As for peptides, it really depends on what type you use. The science on them isn’t as solid but there’s no harm in adding them to your skincare routine. I’ve just checked out your blog and I love how detailed your reviews are. You really dissect every aspect of a product, which is very helpful. But I’ve noticed that you have to be logged in to comment? I think that could put a lot of people off. If you need any help with blogging, feel free to shoot me an email. Hi Jenn, sorry to hear TruSkin isn’t working well for you. 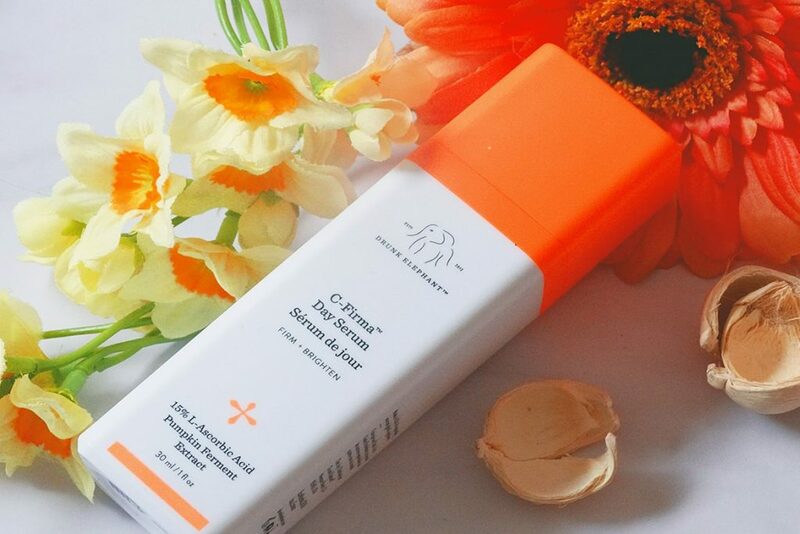 Have you tried Skin Actives Vitamin C Serum? It’s cheap and effective. Hi Georgina, I think it’s a great idea to use the Granactive Retinoid as it can help with your concern. If it leaves your skin dry, then you can look at adding a moisturiser. The Ordinary Natural Moisturising factors would be a good one. Xen, this is one of those myths with a kernel of truth in it. It’s easy to believe that two are incompatible when you delve further into the science, there’s nothing to worry about. Linda, the only serum I’d layer on Retin A is a hyaluronic acid serum. Retin A is very powerful and can make your skin very sensitive so you don’t want to use too much stuff with it. IIRC, Allergan recommend to layer a moisturizer UNDER its Tazorac (another strong retinoid) in order to avoid irritation. So a hyaluronic acid cream before Retin A, or even mixed with it, could be the best option. Sam, that’s a great tip. Thanks for sharing! Kim, I’d just try to use them at different times of the day or on alternate days. Can I use vitamin c (truskin naturals), hyaluronic acid( truskin naturals) and Niamicide 5% (gia naturals ) together.I have a very dry sensitive skin.I want to give all forms of hydration to my skin to stay away from wrinkles and dryness.Plus also want the brightness and glow.If I can use all above mentioned serums than i what order should I use them.I also use milk & honey age defense moisturiser from gia naturals too.If you feel any other product would be beneficial for my requirement than please recommend.Oh i do use retin -A 0.25 % cream fr acne. Kiran, yes you can use them all together. Vitamin C first, then hyaluronic acid and then niacinamide. Or you can do vitamin C and hyaluronic acid in the morning and retain A and niacinamide at night. I have roseca and have bought Niacinamide to put on my skin and just wondered if vitamin c serum would help further or irritate my skin more!?? Jane-Claire, it really depends. I know women with rosacea who can use vitamin C fine and others who prefer not to use it. You need to try it and see for yourself how your skin reacts. If you’re worried, start with a derivative. They’re gentler than pure vitamin C (L-ascorbic acid). Hello I’m glad I read this, I usually use a full drunk elephant skin care regimen day time and night routine I do a ten step k Beauty routine every other night and off night I use a aha/bha serum ,which has niacinamide only based products, I have done this routine for a year and my dark spots from stubborn acne marks have disappeared and also my hyper pigmentation, I’m olive Latina complexion, 40 yrs of age focus on Anti-Aging skin care, recently drunk elephant has reformulated their bhydra now has niacinamide , b5, calling it a serum and not a water gel, I finally got my skin where it’s looking fine, now I’m almost finished with the original formula, is this new formulation going to be ok to mix with their cfirma serum which has done a 360 on my skin. 1 cleanse with cerave hydrating cleanser I use my clarasonic sometimes depending if I need to exfoliate, or I’ll use tatcha enzyme cleanser to get rid of a dead skin will do that a couple times in morning, generally it’s just cerave hydrating cleanser. Tennille, your skincare routine is spot on, well done for putting it together! And yes you can totally use niacinamide with vitamin C, so don’t worry about the new formula, it’ll work. Do you think they actually mean not to mix the powder and solution together, but ok to use the products one after another? Jess, I think they’re still following the old studies that believes this combo to be bad because of the chance of colour. But as I wrote here, the myth has been debunked. Do you have did recipes to make your own serums? What are your thoughts on hydroquinone? Can it be added to the mix as well? Was wondering… Would be more effective to add niacinamide along with the hydroquinone at night instead of only using niacinamide during the day? Do they mix? Chase, hydroquinone is the most effective skin lightener there is so don’t worry about using it alone. Niacinamide in the AM and hydroquinone in the PM is perfectly fine. How about mixing lactic acid or glycolic acid with vitamin C (in the L-ascorbic acid form)? I read all the good info on Niacinamide and vit C and am so glad u did because I wanted to use the Elta MD UV clear spf 46 during the day and it contains both Niacinamide and lactic acid. I follow a simplified K-beauty routine as follows: AM: double cleanse with a ba and then gentle foaming cleanser and Clarisonic, followed by Lancôme hydrating toner, Fresh black tea and Kombucha essence, DE C firma, la roche posay mineral spf 60, DE or Clinique moisturizer (sometimes with rose oil if my skin is crazy dry). PM is essentially the same except I replace the C firma with either DE glycolic serum with Marula oil, Farmacy Honeymoon glow lactic acid serum with night time balm or Retin A and DE LaLa Whip moisturizer (I rotate products). BTW your articles are amazing. I’m a skincare junkie and would love to be a blogger! Lauren, I wouldn’t mix exfoliating acids with L-ascorbic acid as it could be too irritating. 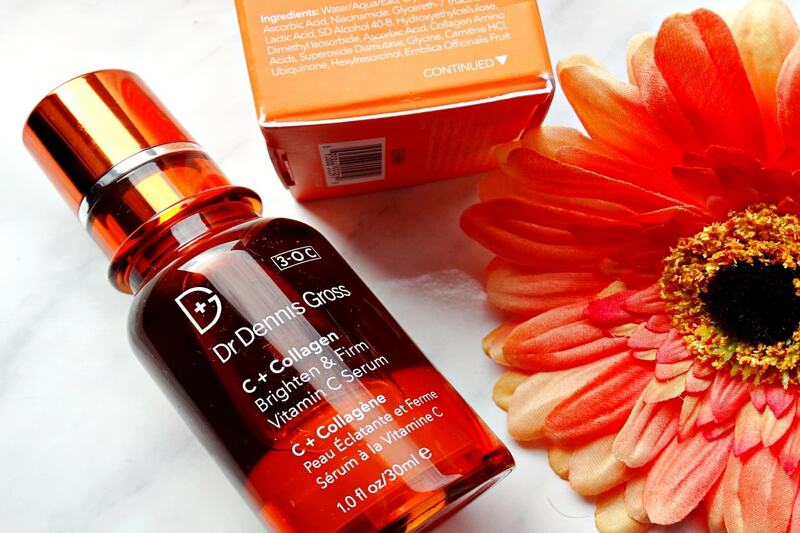 It’s safer to use vitamin C in the morning and glycolic acid at night. Asmriti, apply vitamin C, wait a few minutes and then layer Niacinamide on top. Hi there. I wanna ask u sth… if I put my vitamin C first then I layer it again with Niacinamide without waiting time, is it okay? Fyi, i have oily combi skin. Thx. Candy, yes it is ok. Only in the rare case your skin flushes red afterwards you need to use them separately.